Hey there! It's a bit late on a Friday night but this late night post is for a good reason. August brought us celebrations for 5 of the Digit-al Dozen ladies' birthdays. I couldn't believe it when I saw there were 5 birthdays. There's not that many of us...that's 25%! August has the birthdays of Lothwen, Sarah, Kirsty, Tamara and Michelle. 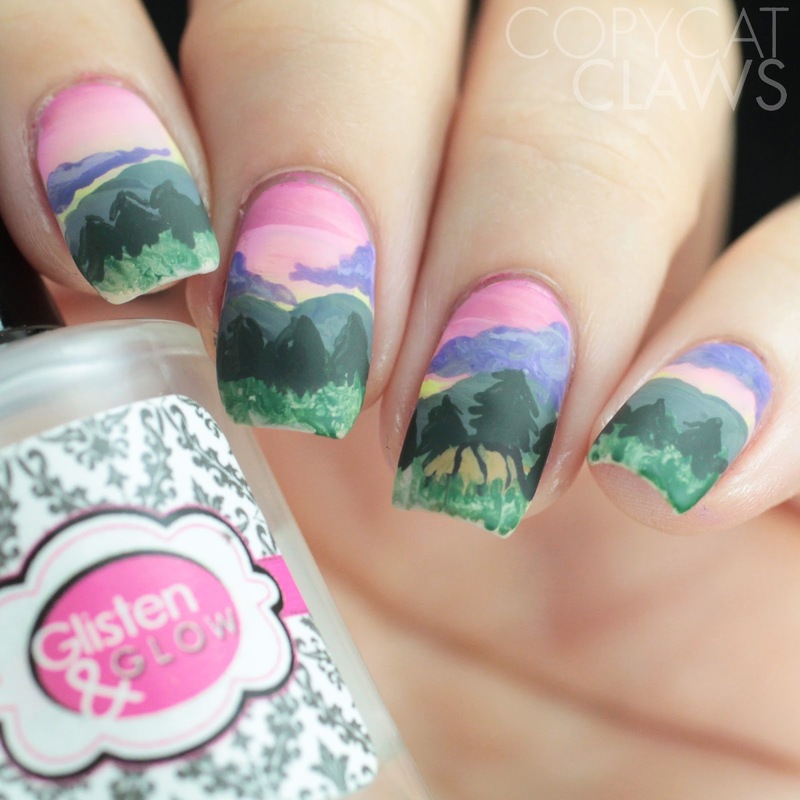 That means they got to pick a photo for us to translate onto our nails. They picked a nice one! Hey there! 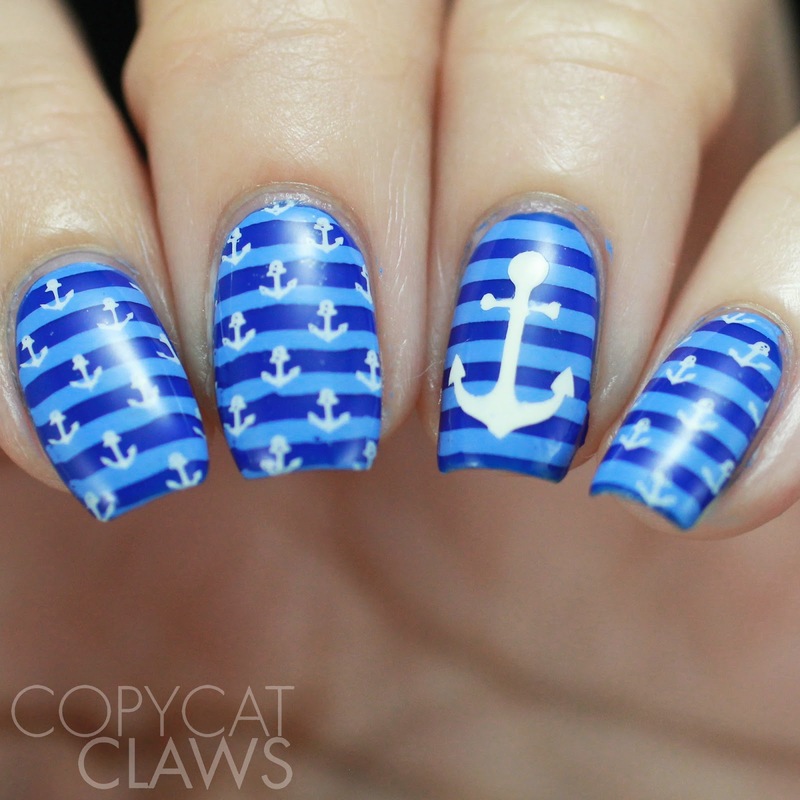 Today's 26 Great Nail Art Ideas theme is Pattern on Pattern/Double Stamping. 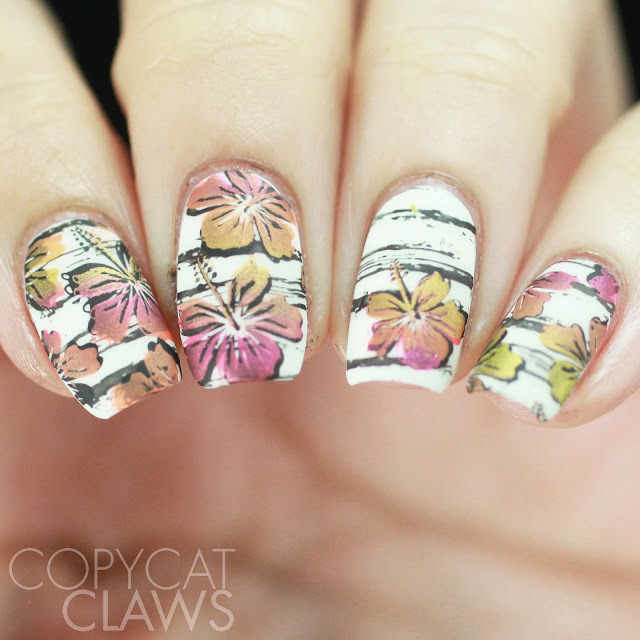 I double stamp my nails a lot (thank you clear stampers) so I thought I'd try something a little different - a mix of striping and stamping. 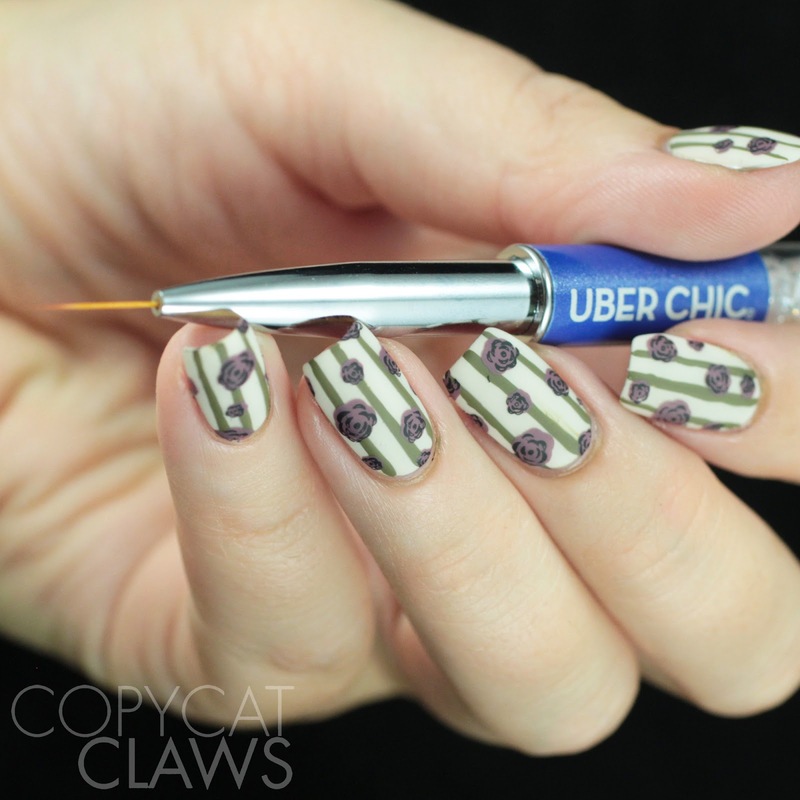 I had just received UberChic Beauty's Striper Nail Art Brush to try out so I figured this would be the perfect time to give it a shot. 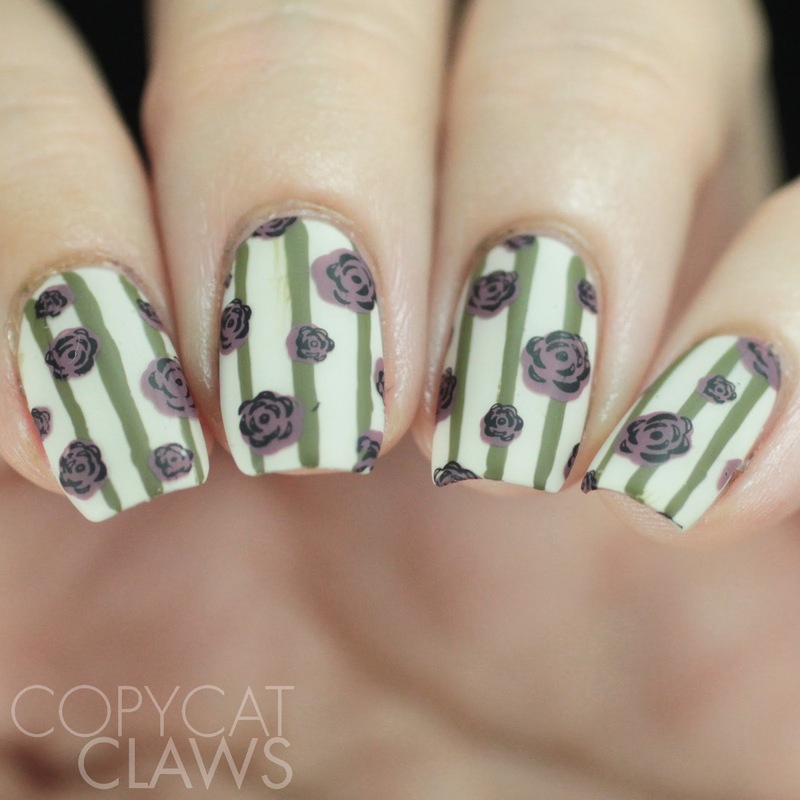 I combined with with some stamping from one of the older collections to create this almost vintage-looking design. Hey there! Today I have a couple of products from Cici & Sisi that I received right before I went on holiday and, since I didn't do any nail art while I was away, my review of it is a bit delayed. But I'm happy I'm getting to it now. 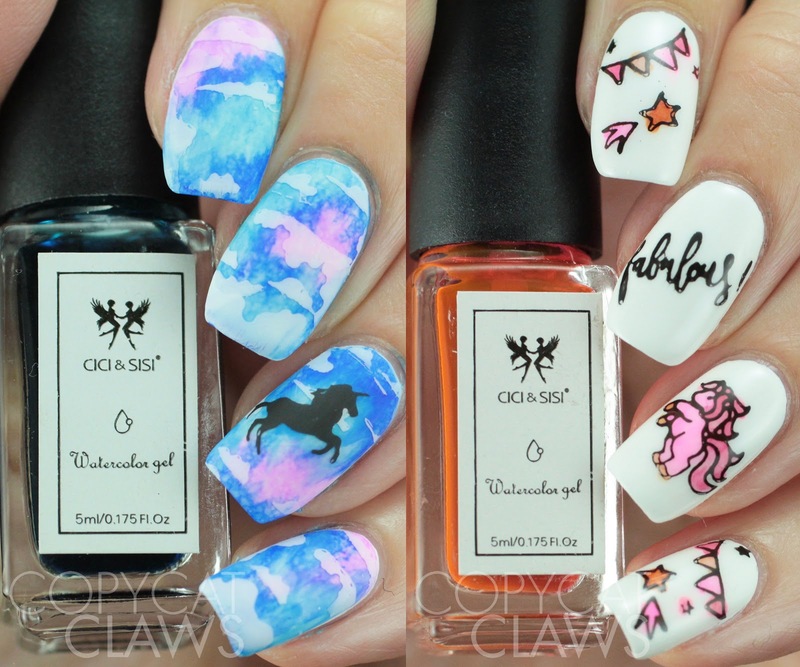 I received one of a unicorn-themed acrylic stamping plate and 2 of their series of sheer polishes for nail art. As someone who really enjoys the looks that can be achieved with sheer polish (e.g. leadighting, watercolors) I have accumulated quite the collection but these were a joy. Keep reading to hear all my thoughts on these new products. Hey there! Today I have another Maniology (previously known as Bundle Monster) stand alone plate to take a look at. This is the Special FX: To Dye For plate. This plate has 10 full nail tie-dye designs (hence the name) and an assortment of tinier bohemian images that complement the hippy-like feel of the plate. I've tried tie dye nail designs a few times (one of which was even taken by someone and made into a painting somehow...she proceeded to block me on Instagram when I asked her about it) and this plate makes it WAY easier than trying to do it by hand. 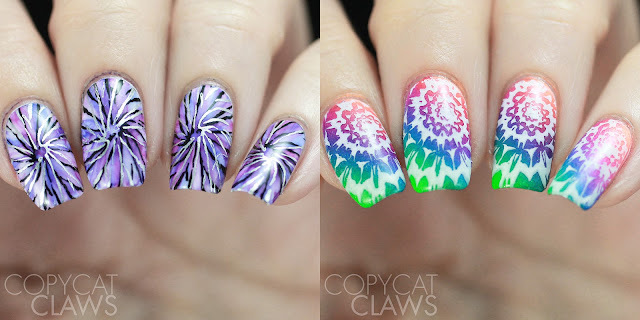 If you're a free spirit, drawn to tie dye designs, this plate is awesome! Hey there! Today I have swatches of some of the wide range of Kokie Cosmetics nail polishes . For those of you who might not have heard about the brand, it's a brand that emerged a few years ago from the founder of Sinful Colors. They have an entire range of cosmetics. 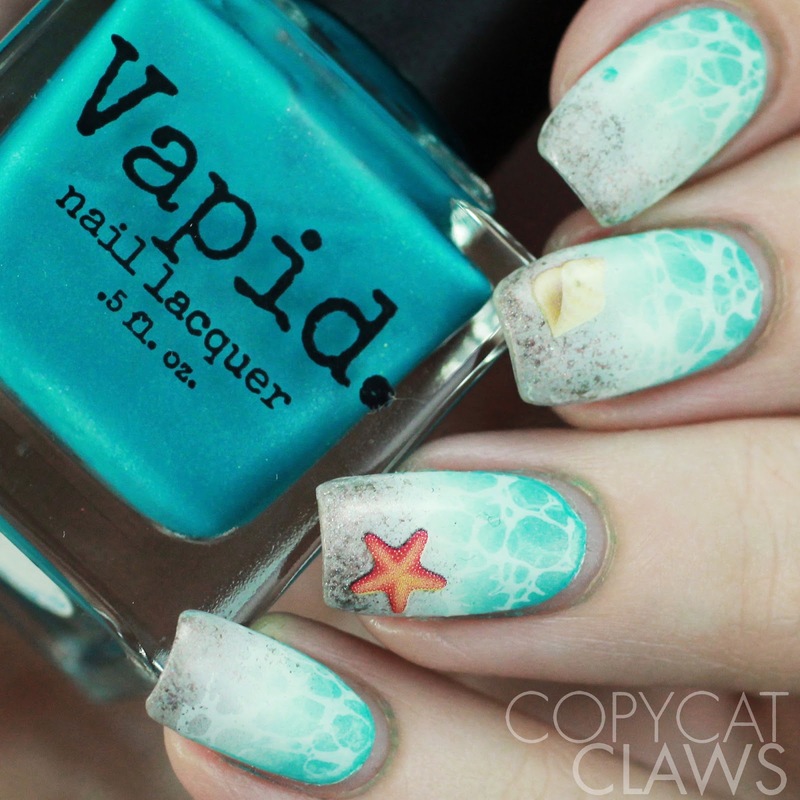 I've only tried the nail polish (which is 3-free and cruelty-free) and I've really liked it. It's sort of proof that, as much as I love indies, a good drugstore brand deserves love too. I use a lot of cremes in my nail art so I'm happily adding these to my collection. I'll start with swatches of some of their pastels and then a few others. Hey there! 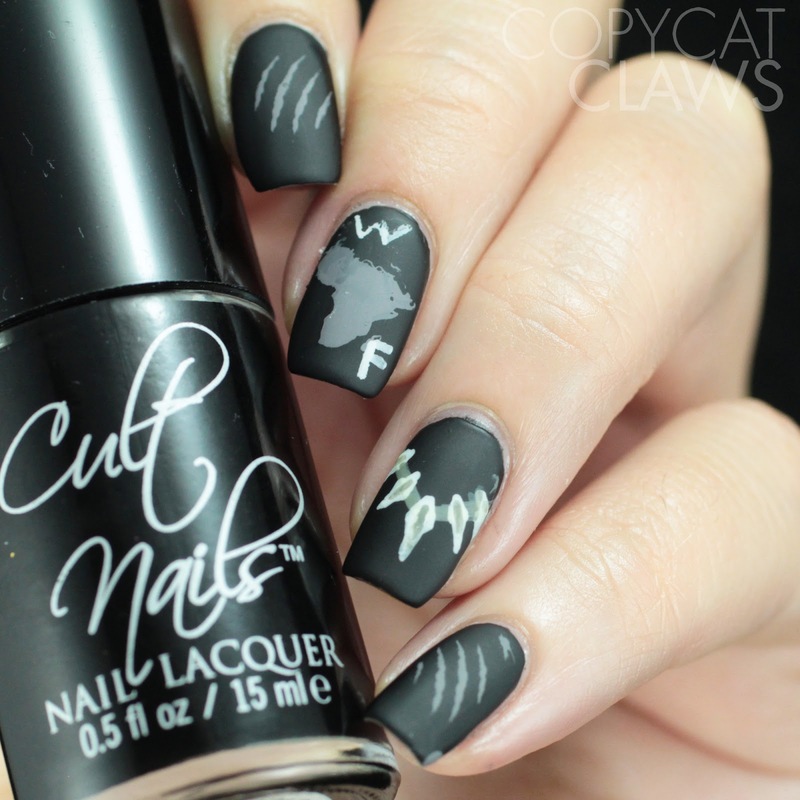 Today's Nail Crazies Unite prompt is Superheroes/Villians. I'm not big into the superhero scene so I wasn't sure what to do. BUT then I remembered that Black Panther is a superhero and I love both the movie and, even moreso, the soundtrack to that movie. I knew that that was the superhero I'd have to do. 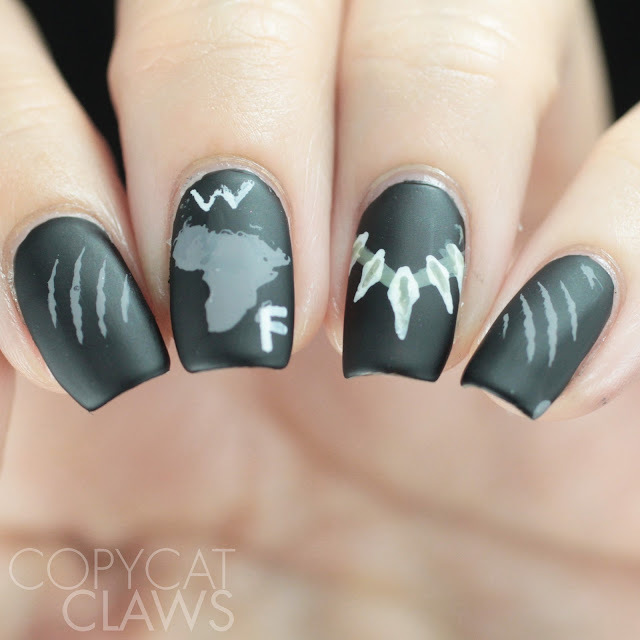 Since I certainly don't have any Black Panther stamping plates, I had to be a bit creative in how to come up with some nail art. I ended up with a mix of stamping, stencils and freehand. I'm not sure these would be recognizable to anyone who isn't familiar with the movie but I did send a pic to my superhero geek friend (which I say in the most loving way possible) and he said he liked them. Since he hates all things nail art, I'll consider that a win. Hey there! Today I have my first post since Bundle Monster rebranded to Maniology. In case you hadn't heard, they've changed their name to better represent their focus on all things nail-related, which I'm all for. It might be a bit confusing since the older plates are still named with "BM" but I'll try to refer to them as Maniology from now on (though I fully expect I'll make some mistakes since I do use my Bundle Monster plates a lot). 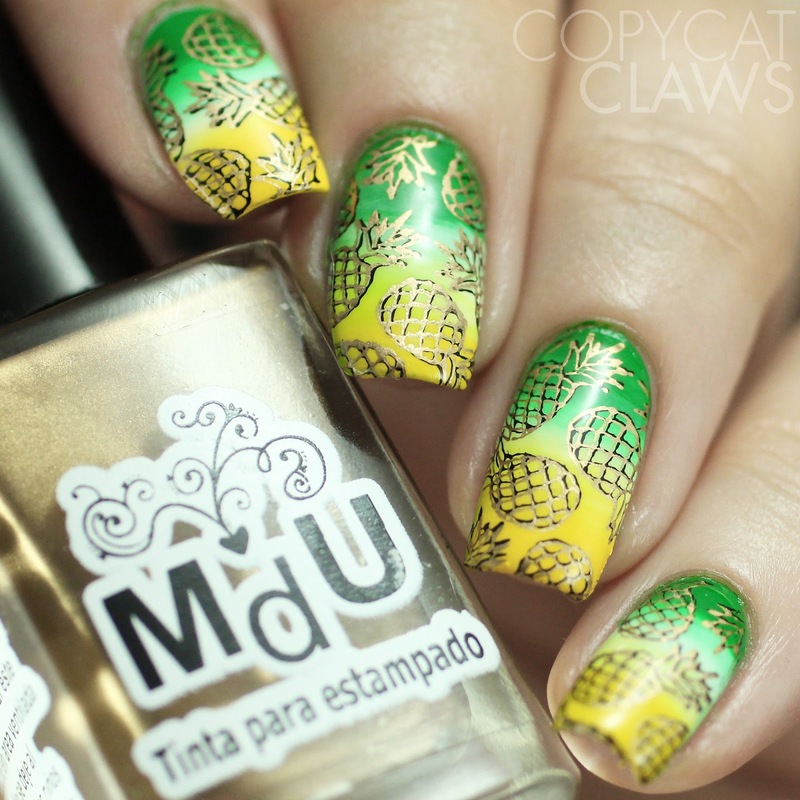 Today's post is about BM-XL222, a collaboration plate with Nails By Miri. If you're interested in this, or any other Maniology products, don't forget to use my code COPY10 to save 10%. Hey there! Today I have a couple of really nice polishes to share with you guys and they just so happen to be fundraising for a really nice organization. Tiffany, of Polish and Paws, is a huge animal advocate so she was motivated to contact LynBDesigns and Sassy Pants Polish to organize a collaboration box in support of The Pig Preserve. The Pig Preserve is a sanctuary that takes care of all breeds of pigs, saving them from neglect or abuse. Doesn't that sound like a worthwhile cause?! I'll link a video with more information on The Pig Preserve towards the end of this post. 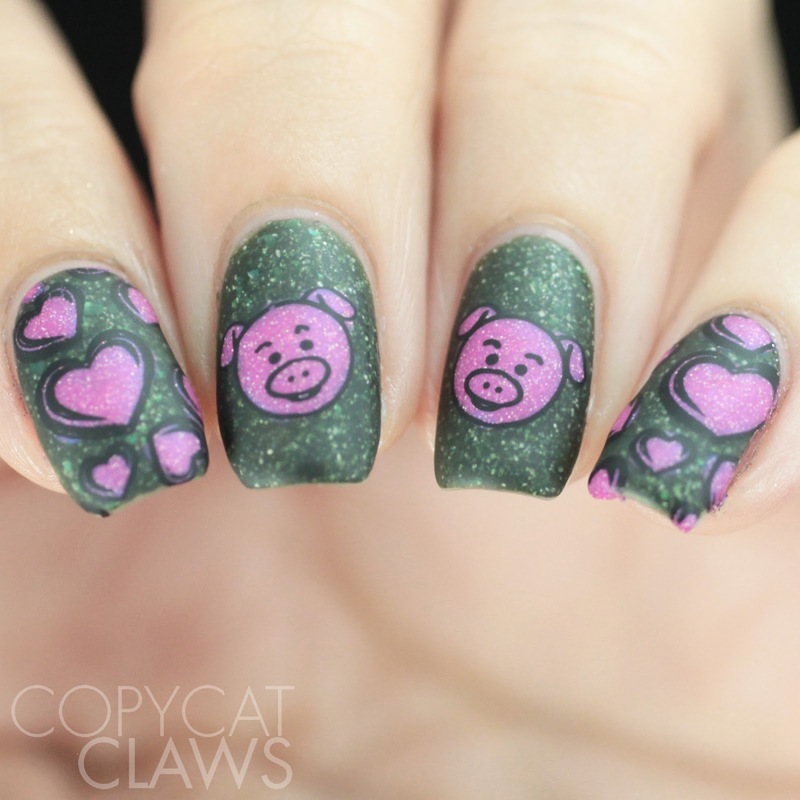 The polishes are available in a full box, including a cute pig-themed soap, or individually. All items will have a portion of the price going to the charity. Hey there! Alas, it's the last day of The Digit-al Dozen's Tropical Week. Of course I couldn't let the week go by without a sunset mani. 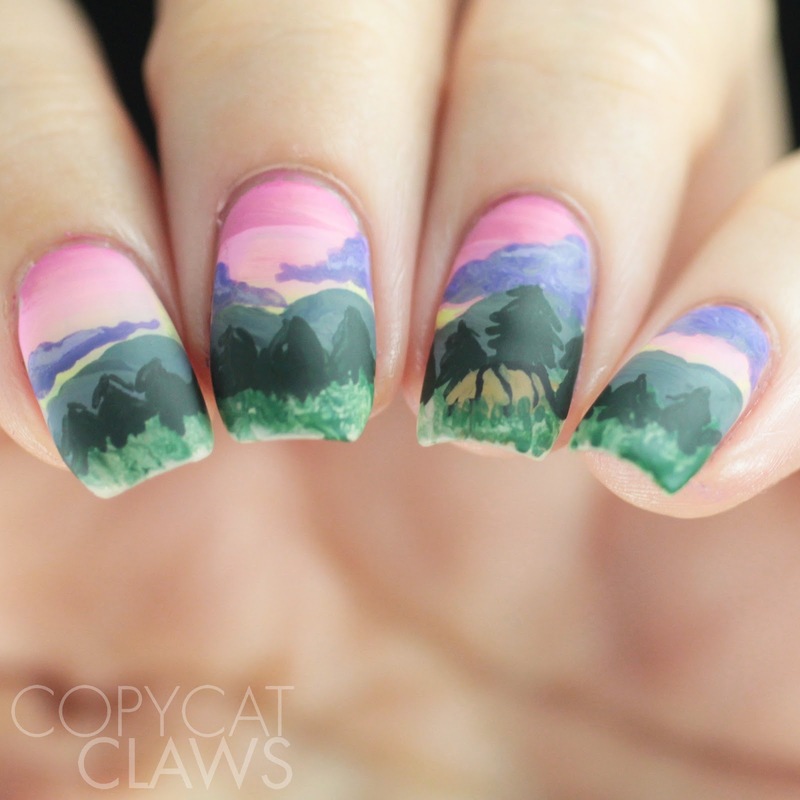 It just so happens that 26 Great Nail Art Idea's prompt this week is Silhouette so it was pretty much a match made in heaven. 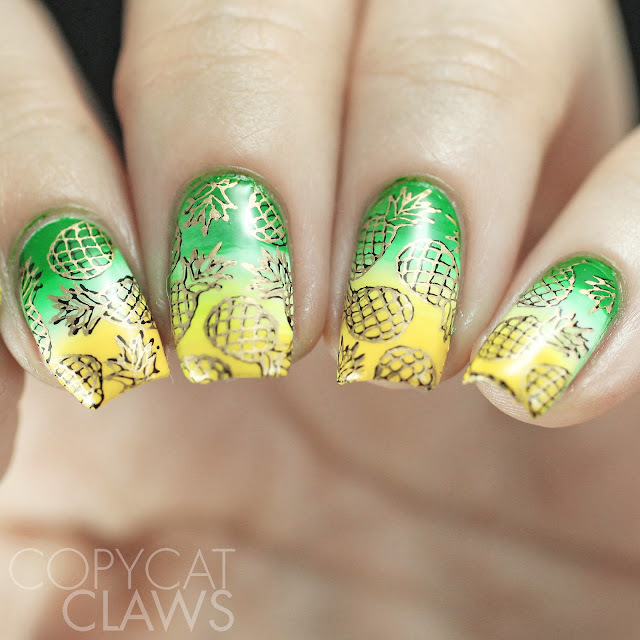 I took the opportunity to use a few stencils from Whats Up Nails that I used last year but I messed up with. It's pretty much been haunting me for over a year. Hey there! 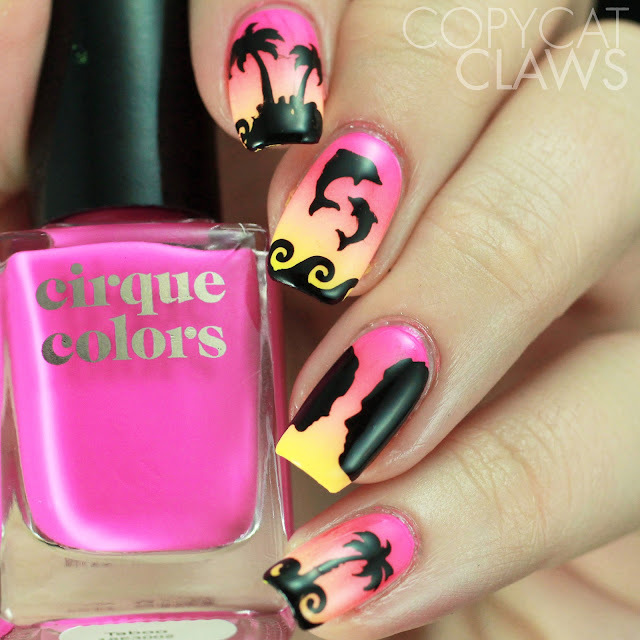 It's Day 4 of the Digit-al Dozen's Tropical Week and I have to admit, this was the hardest mani for me to come up with. I had 4 done (including tomorrow's) but struggled to come up with a fifth for some reason. It might have had something to do with the fact that my holidays were coming up and I wanted to get these done before I left because I wasn't bringing all my nail stuff with me to the cabin. Somehow having that deadline gave me whatever the nail version of writer's block. 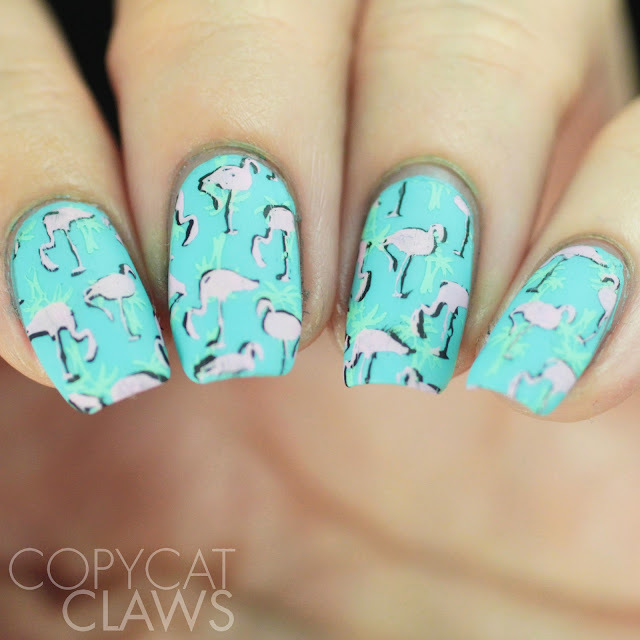 In the end, I ended up with another double (well technically, it's triple) stamping look, kind of like yesterday's. Hey there! For Day 3 of The Digit-al Dozen's Tropical Week, I did some hibiscus flower stamping inspired by a couple of manis from one of my favourite nail artists, @ladyandthe_stamp. 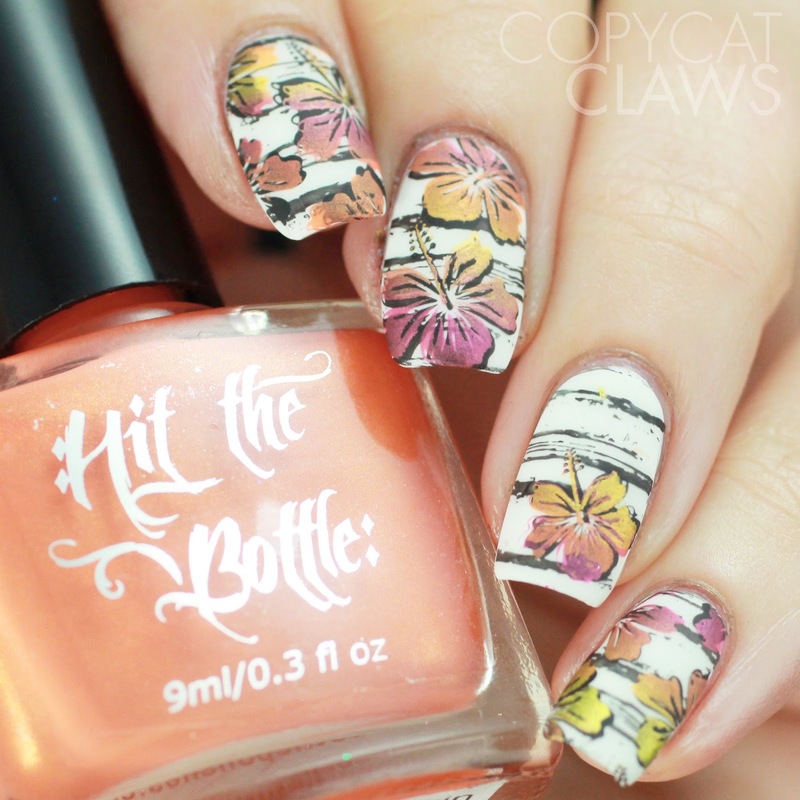 She's been doing #hawaiianshirtmanifriday on Instagram lately which means she's had so many great tropical nails. 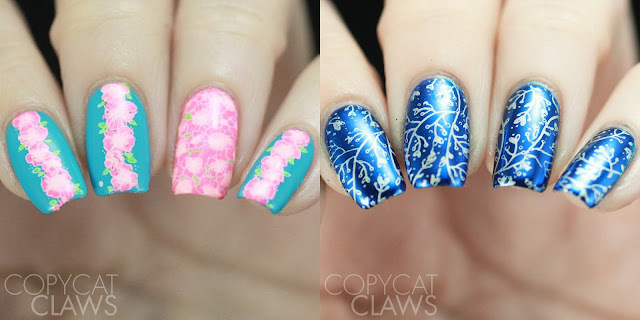 Mine aren't copies of hers but rather inspired by some of her layered stamping. They just reminded me of something she'd do (though hers are always incredible compared to mine). Hey there! 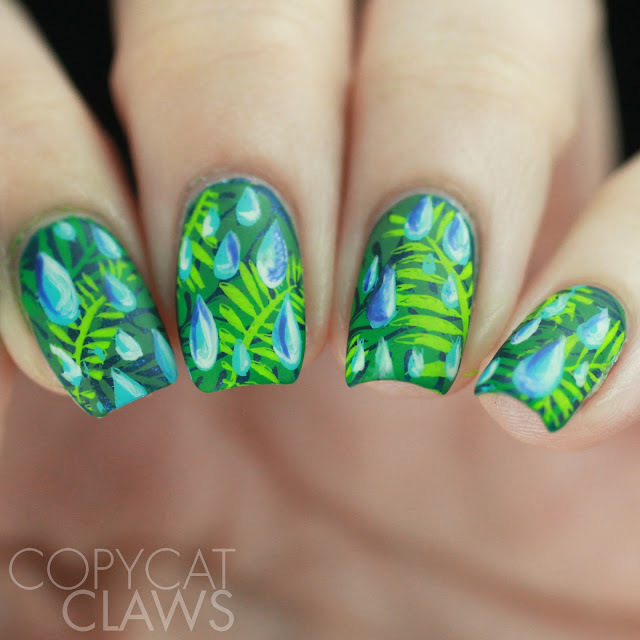 For my second Digit-al Dozen Tropical mani, I went with an old favourite. 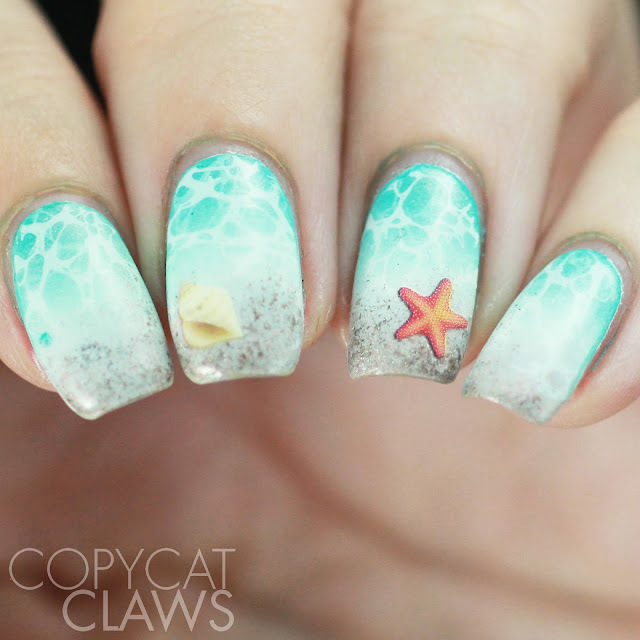 I will never ever tire of beach manis and I was pretty happy with how these turned out. 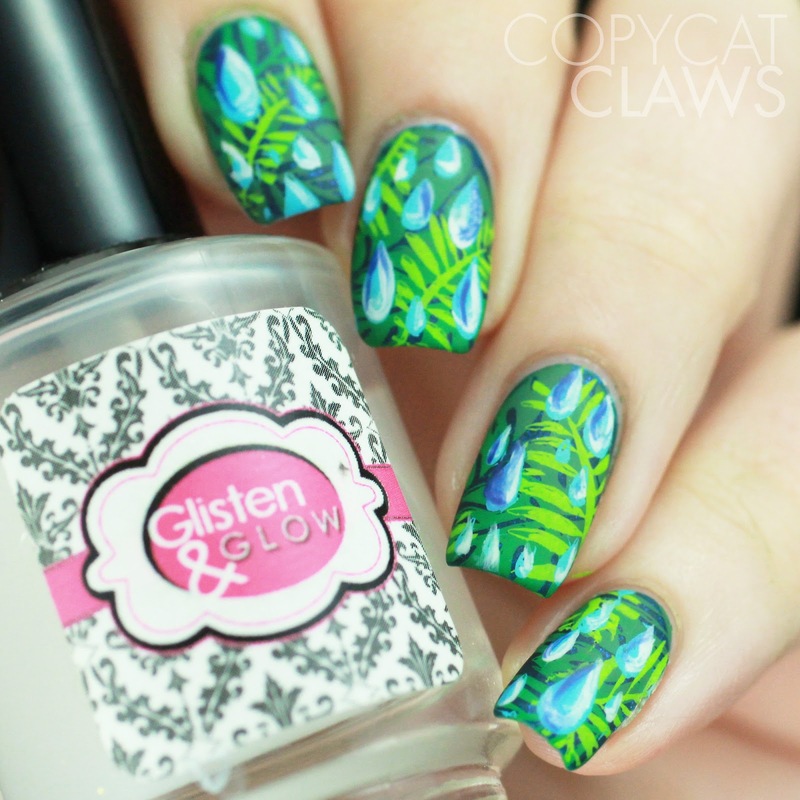 There was so much to it - a gradient, pond-ish stamping, sponging and water decals. But well worth it since I really enjoyed wearing these. Anyway, I decided to start Tropical week with a rainy scene. I don't know why I'm starting with this instead of sunsets and birds and flowers but it's just speaking to me. Maybe because I'm in a rainy mood after leaving the lake :-( Oh maybe it's because I really like this mani which turned out as a mix of stamping with a few freehand touches. 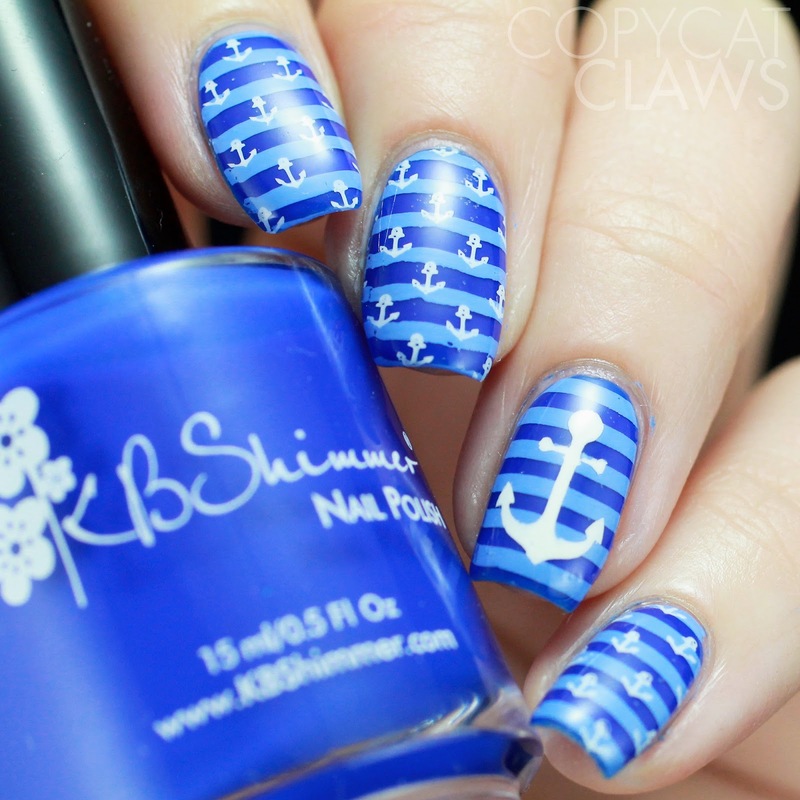 Today's prompt for Nail Crazies Unite was Blue & White Nautical. Hope you like what I came up with! Hey there! I'm back for my second blog post of vacation...I must've really been missing you guys! Today I wanted to pop in and share my thoughts on the two new plates from UberChic Beauty. The first plate is Art Deco Chic, a plate inspired by the arcitecture and fashion of the 1920's. I absolutely loved The Great Gatsby movie and this plate reminded me so much of it...in other words, I'm a fan! The second plate is Cultural Rhythm, inspired by cultures from across the globe. I enjoyed both of these plates a lot but both of them reminded me of one of my shortcomings in stamping....straight lines are hard! All the stamping worked flawlessly but my lines always end up wiggly. Hey there! Long time, no talk! I've been thoroughly enjoying my vacation but since the sun is gone for the day and it's too smoky (from forest fires in the neighbouring province) to see the stars tonight, I'm stuck indoors. I figured it'd be a good time to pop in and say hi. 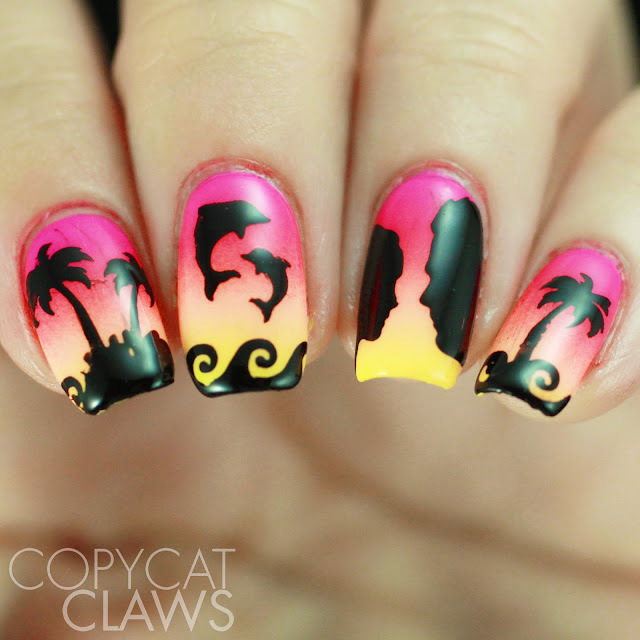 And finally post the mani I did for last week's 26 Great Nail Art Ideas prompt of Stamped Gradient. Well I love gradients AND stamping so this was fun. I even did the gradient with stamping to sort of double-up on the theme!